Watch out for this bomb from Chopped Herring!!! 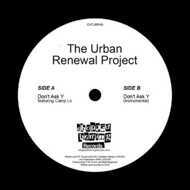 The Urban Renewal Project is a 13-piece big band out of Los Angeles, founded by musician R.W Enoch. This is an extremely dope 45rpm single featuring none other than Geechi Suede and Sonny Cheeba of Camp Lo. Included is the vocal and instrumental for your listening pleasure.